By Sam Smith | 1.2.2016 | 10:15 a.m. The Bulls Friday began the 2016 new year with what is becoming a welcome formula from the old year, a dominant performance from an eclectic group of reserve players. The result was a fourth quarter rout on the way to a 108-81 victory over the New York Knickerbockers. Jimmy Butler led the Bulls with 23 points and Nikola Mirotic bounced back from a scoreless game with 17 points and a career high seven assists. But with rookie Bobby Portis solidifying a hold on a spot in the regular rotation with 16 points and 10 rebounds, the Bulls got a 42-26 boost from their bench and an average of 48.3 points per game from the reserves over the current three-game winning streak. It was the lowest scoring fourth quarter in Knicks franchise history and the second fewest the Bulls ever have given up in the fourth quarter in the 4,000th game in franchise history. The victory raised the Bulls record to 19-12 with the fourth win in their last five games. They’re now fourth in the Eastern Conference, a half game behind second place Toronto, whom they visit Sunday to start off a stretch of 14 of the next 20 on the road. So they’ll need production from a lot of areas as Derrick Rose missed a second straight game with hamstring soreness. Bulls coach Fred Hoiberg said Rose will travel with the team to Toronto and is considered game to game. Hoiberg said Joakim Noah will be reevaluated for his shoulder injury Monday and could be back playing soon. Which will raise more intriguing questions as the Bulls closed Friday’s game and pulled away impressively and decisively with a lineup of Butler, Portis, E’Twaun Moore, Doug McDermott and Mirotic. It’s yet another of the grab bag lineup surprises that Hoiberg has pulled out this season, many producing. McDermott, finally getting some catch-and-shoot openings with Moore actually the one pushing the ball, was three of four on three pointers and five of nine overall for 13 points. “A lot of us have been in it together the last two years,” noted McDermott. “Me and E’twaun, we’ve worked out a lot with each other; all of us have chemistry. Me and Bobby played summer league together. We know each other. It’s good to have the young group mesh because we hope to be here a long time. For Mirotic as well as he had two points combined the last two games and perhaps has been hearing the thundering footsteps of rookie Portis making himself difficult to keep out of the lineup. Portis is averaging 11.3 points and 6.9 rebounds the last seven games beginning in that game in New York when the starters were being dominated. But in the last three games—all wins—in his first consecutive regular playing time of the season, Portis is averaging 14.7 points and 8.7 rebounds. And Hoiberg said after the game he no longer can keep Bobby down on the farm of inactivity after he’s lit up the games like being in Paree. Portis did again with a featured matchup against Knicks star rookie Kristaps Porzingis, who had nine points and nine rebounds. But Portis led the Bulls in rebounding in about 30 minutes as his hustle on the boards proved infectious with a 54-42 Bulls rebounding edge. For Portis, who admitted he also regularly encourages himself in the third person on the court though by his nickname BP, continued being animated as well with trash talking to Knicks star Carmelo Anthony and urging on the crowd after a late score in the Bulls dominant run. “I just try to bring positive energy,” said the precocious rookie who seems intent on elbowing his way into the Rookie of the Year race. “I feel that’s my role on the team, to come off the bench and provide that energy and be that spark and everything will take care of itself. “I have to earn my stripes,” Portis said when asked about not playing much the first two months. “That’s something I like about the Bulls. They just don’t put rookies out there. They make you earn your keep; that’s something I’ve always tried to do, earn everything that is given to me. I don’t really try to look at numbers. I like to look at wins. I want to be a winner and if I’m out there scoring that doesn’t mean anything. I want to win basketball games. It wasn’t my time. I had to work my way up. And the community with enthusiasm for Portis whenever he enters the game and the organization sure love Portis. It’s actually a pretty remarkable occurrence and unprecedented that the Bulls have been able to put the pieces in place for a young core with draft picks all in the bottom third of the first round with Portis at No. 22, Mirotic at No. 23 and Butler at No. 30. Plus, Taj Gibson was selected 26th. It’s almost too much of a good thing as Hoiberg has the problematic task of working in Portis with veterans playing well like Pau Gasol with 17 points and eight rebounds and Gibson with seven points, nine rebounds and two blocks. The Bulls defense and lineup stabilized with Gibson going into the starting lineup Dec. 9. 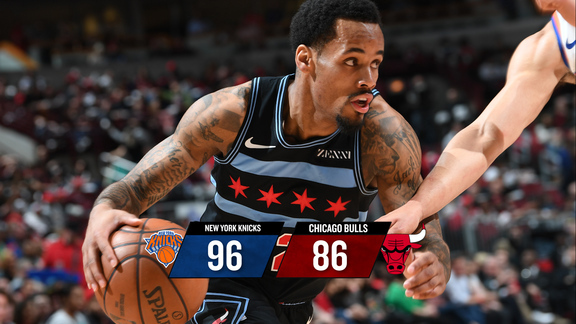 The Bulls quickly won four straight, had that hiccup compounded by the four-overtime loss and ensuing travel and now winning four of five. Plus, Noah should soon return with Mirotic Friday showing the skill and versatility he can bring. And not even playing his position because of the overloaded front court. Mirotic got the Bulls off to their fast start, a 20-4 lead with 5:24 left in the first quarter with 11 first quarter points and three of five three pointers. Mirotic seemed more in control, taking his shots and not trying to force too much. And then in the fourth quarter after the Bulls broke from a 77-73 lead after three, Mirotic was instrumental with a pair of steals, drawing an offensive foul, three assists as that group moved the ball with alacrity and a 31 foot three pointer with 10 seconds on the shot clock that Butler admitted left him muttering an expletive until it went in. And imagine if he could return to his natural power forward/stretch four position? Hoiberg has tinkered and noodled with the starting small forward position with Mike Dunleavy sidelined perhaps another month or so. Tony Snell started; McDermott had a shot. Hoiberg has settled on Mirotic for now with his three-point shooting as he leads the team in makes. It’s been impressive the Bulls have remained one of league’s best defensive teams—No. 1 in opponent field goal percentage—with so much mixing and matching with matchups with Mirotic more a big man defender along with Gasol and Gibson. It was hard for the Bulls only after awhile Friday. They ran out to that big lead, Mirotic even with a classy crossover drive for a score. It was 34-18 after one quarter and 55-38 late in the second quarter when Gasol and Butler connected on what has become a regular back door lob cut play, 10 straight games now. Butler also had a steal in a league best 39th straight game. But the improved Knicks at 15-19 show remnants of the triangle offense with excellent ball movement at times. They closed the half with a 12-1 run with three-point shooting to suddenly be within five. The Knicks even took a 67-65 lead midway through the third quarter against the now tentative starters with Brooks in foul trouble. But it was Moore and Portis who triggered a change, Brooks pushing the ball out of the backcourt, Portis with a three and on the boards. Gasol got a spin move for a score and it was 77-73 Bulls after three. 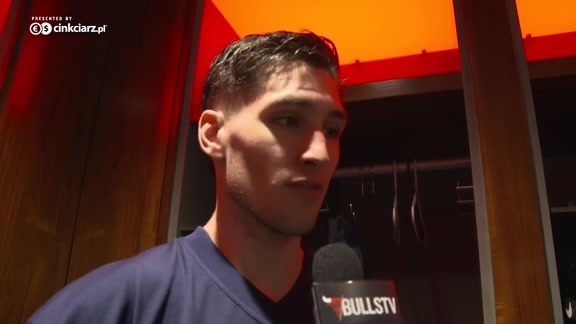 The Bulls with a Mirotic slam dunk score on a Moore pass and then a Mirotic pass to an open Portis for a jumper started the Bulls on a 7-0 opening to the fourth quarter. Then Mirotic with his long one and McDermott with three regular sized ones turned it into a rout as the Bulls didn’t have to sweat through a fourth quarter for a change.